If you haven’t had any outdoor reared rare breed Berkshire pork before, you are in for a revelation. From one pig you get approx 40 kilos of meat. We sell a minimum quarter of a pig at a time which is 10 kilos (as joints, chops, ribs, rashers, etc) – if you want less than that you could buddy up with a friend. 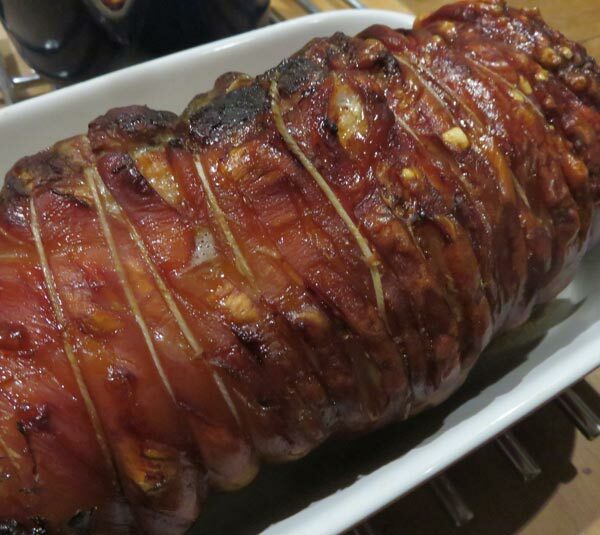 The pork joints produce the most extraordinary crackling and the gammon steaks and joints are celebration food, with the bacon almost too good for a bacon sarnie; this is seriously superb stuff. Berkshire pork is known in Japan as Kurobuta pork, revered as the world’s best pork because of its rich, juicy, tender, flavoursome qualities. But you don’t have to travel to Japan to try it as we courier our pork and gammon direct to your door. 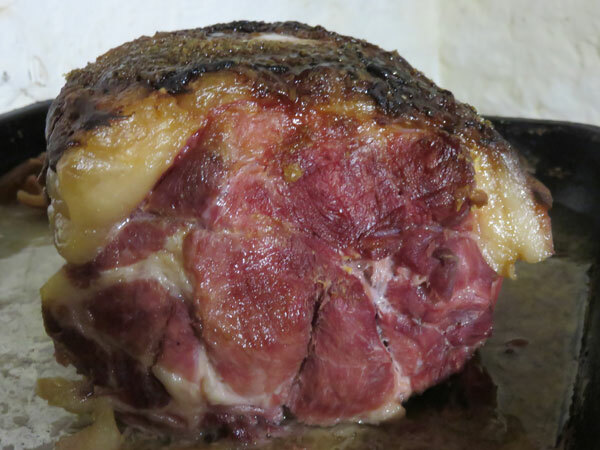 By eating rare breed meat you are supporting the breed by ensuring it has a firm footing in the food chain and this is the best way to ensure their long term survival; rare breeds become rare because they are not being eaten and therefore not being bred. If you would like to go on our meat mailing list please get in touch. To give you an idea of contents, half pig pork boxes will include approx: 3 large shoulder joints, 4 leg joints, 2 belly joints, 16 thick cut chops, sausages (we normally go for pork & apple), 1 tenderloin and liver. Let us know if you want the trotters. Do contact us to place your order or with any questions. 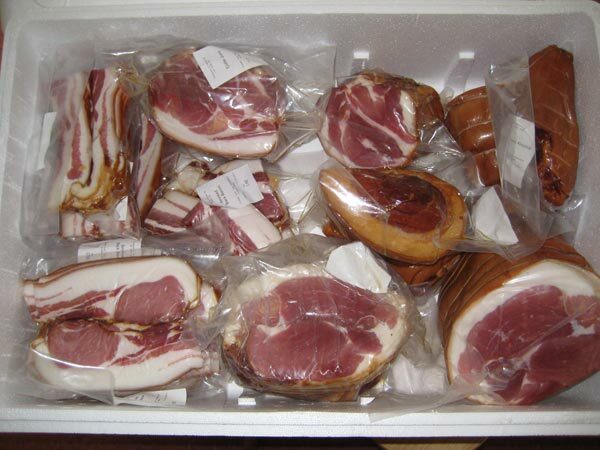 The mixed box will be delivered on different dates, the pork arriving a week or two before the gammon and bacon. 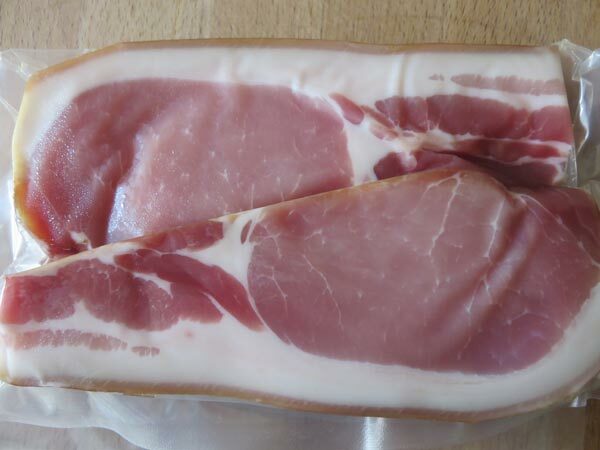 Gammon and bacon can be smoked or green as you prefer. If you like your bangers, why not have a go at making your own? For ourselves we use half a pig (in one piece) and remove the meat from the bone, chop, mince and put through our ancient Kenwood; it’s more fun than you can imagine and highly recommended for uncontrollable giggling sessions if you are not averse to plunging your arms into heaps of minced pork. We source our natural sausage skins here.